A man on stilts, walks through the grounds of the Hexenagger Castle in Bavaria, Germany, entertaining guests at the annual christmas markets. at the Hexenagger Castle in Bavaria, Germany. A collection of pictures from our visit to the Christmas Markets (Weihnachtsmarkt) at the Schloss Hexenagger (castle/palace), Bavaria, Germany. 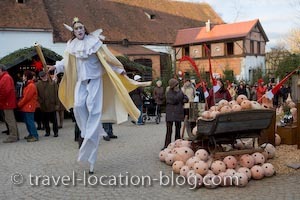 A man on stilts dressed as a fairy, looking for christmas gifts and interacting with the crowd at the Christmas Markets at Hexenagger Castle, Hexenagger, Bavaria, Germany, Europe.